Don’t expect Bryce Harper to accept any discount. According to reports, the All-Star outfielder is seeking a deal in free agency that will pay him more than New York Yankees DH Giancarlo Stanton, who signed a 13-year, $325 million contract with the Miami Marlins back in 2014. 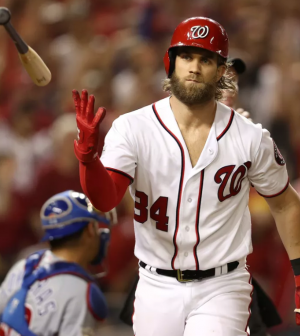 So far, four teams continue to express major interest in signing him: the Washington Nationals, Philadelphia Phillies, Los Angeles Dodgers, and Chicago White Sox. Not many details have been discussed about contract offers, but it was reported the Nationals recently increased their offer to $300 million over 10 seasons. Harper, 26, has posted a .279 batting average, .900 OPS, 184 homers, and 521 RBI over a span of seven seasons with the Washington Nationals. Aside from winning the NL Rookie of the Year in 2012, he is also a recipient of the NL MVP Award (2015), Silver Slugger Award (2015), NL Hank Aaron Award (2015), NL home run leader (2015), and most recently won the Home Run Derby at the 2018 MLB All-Star festivities.